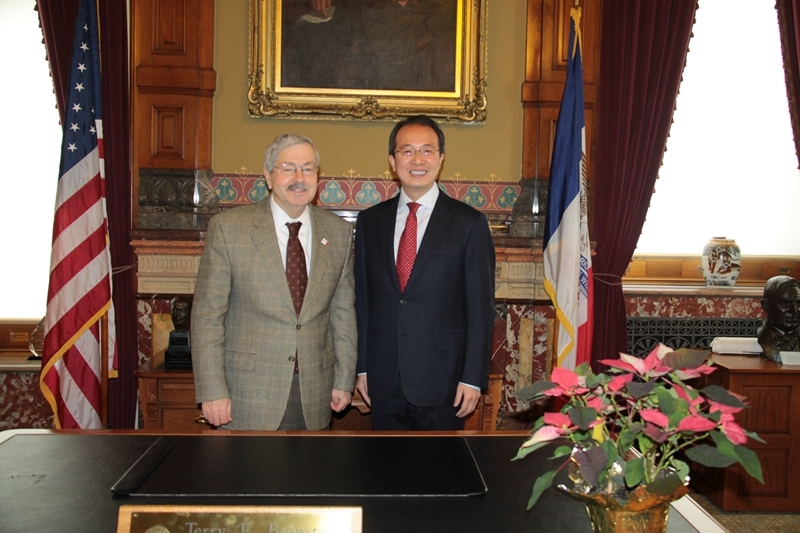 On January 5, Consul General Hong Lei met with Governor Terry Branstad in Des Moines, Iowa. Consul General Hong Lei congratulated Governor Branstad on his successful visit to China last November and signing of cooperation agreements. 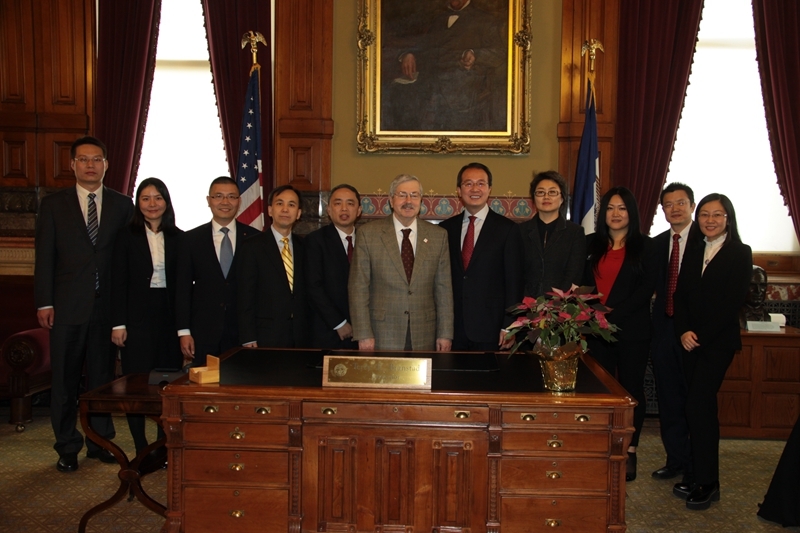 Consul General Hong Lei expressed his appreciation for Governor Branstad’s long-term commitment to promoting Sino-U.S. relations, especially the cooperation between China and Iowa in various fields. Consul General Hong Lei also congratulated Governor Branstad on his nomination as the new U.S. ambassador to China, stressing that Sino-U.S. relations have made great progress in the past 38 years since the two countries established diplomatic ties, which has not only benefited the two peoples but also promoted the world peace and development. China attaches great importance to Sino-U.S. relations. Both sides should respect each other's core interests and major concerns and conduct extensive and in-depth cooperation on the basis of equality and mutual benefit. By doing so, we can bring good to the two peoples and make greater contributions to safeguarding world prosperity, stability and security. Governor Branstad talked about his visit to China last November. He said he was proud of the sister state relationship between Iowa and Hebei province and he was glad to see that U.S.-China relations have witnessed remarkable development over the past few decades. He was encouraged by the positive response from the Chinese government and people on his nomination as the new U.S. ambassador to China. As an old friend of the Chinese people, he supports U.S.-China efforts in developing mutually beneficial and win-win cooperation. Mr. Ni Pin, President of Wanxiang America Corporation, Mr. Xu Kefei, General Manager of Bank of China Chicago Branch and Ms. Zhang Qiang, General Manager of Jiusan (America) Group , members of the Chicago Chapter of the China General Chamber of Commerce-U.S.A., were present at the meeting. They briefed Governor Branstad about the Chamber of Commerce and the respective business growth of the companies they represent with the Midwest and Iowa in particular.